When children enter 3rd grade, the emphasis changes from “learning to read” to “reading to learn”. Because of this jump in the emphasis on reading, I call the following strategies 3rd Grade Reading Help, however, these strategies are great for all children who are learning to read. Children should be able to read grade-level novels and text books. Their reading fluency should sound like conversational speaking, and their comprehension should be strong. If your child is struggling with reading fluency and/or reading comprehension, there are 4-simple strategies you can use to increase their reading ability. For kids who struggle in reading, school can quickly turn from the fun-loving place that children experience in kindergarten into four walls that lock away their self-esteem. Children who struggle with reading often feel insecure and begin to dread going to school. As a parent and as a teacher, I used these four strategies to help both my children and my students excel in their academics. First of all, reading should be fun for kids. However, if a child is stopping to sound out one word after another, the storyline is lost. If the storyline is lost, there is no reason to love reading, because you don’t even know what happened in the story. If you child is in 3rd grade or higher and still struggles sounding out words, you may want to look into a systematic program like Reading Horizons. They have a proven formula for success. I have more information about their program at the end of this page. Achievable Books are my number 1 strategy for 3rd Grade Reading Help. There are three levels of achievable books that spiral up in difficulty from preschool all the way through 6th grade: predictable books, chapter books, and young adult books. I have included some of my favorite books with links that make it easy for you to check them out. Make sure your child has plenty of achievable books available to read. These should be books that your child is interested in reading. If your child loves horses, find books like “Black Beauty” or “Foals in the Field” for younger readers. If your child is still in the very beginning stages of reading – predictable books are a Godsend. Predictable books allow children to guess what is coming next. This is important, because strong readers are constantly predicting without even being aware of it. Over time, children who read predicable books develop an understanding of the storyline, plot, sentence structure, grammar, spelling, reading fluency, and above all – reading comprehension. 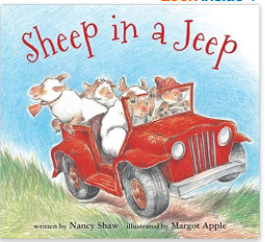 Sheep in a Jeep is my all time favorite, because I used to read it to my youngest son. After reading this book to him about three or four times, he was able to read the entire book to me. He was in preschool at the time. Sheep in a Jeep has a repetitive sentence structure and gives context clues in the form of pictures that help children predict the storyline. The skills acquired through this early form of reading predictable books gave my son strong attributes in understanding of the storyline, plot, sentence structure, grammar, spelling, reading fluency, and reading comprehension. As children develop their reading skills they can move into slightly more difficult predictable books. These books are still fairly predictable with repetitive sentence structure, but the sentence structure is more complex. 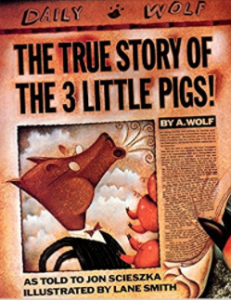 One of my favorites is The True Story of the Three Little Pigs. It’s quite funny, telling the story of the Three Little Pigs from the wolf’s point of view. These predictable books continue to develop children’s reading skills and prepare them for chapter books. Chapter books are perfect for children in 3rd and 4th grades. These books are written with an appropriate sentence structure for children in these middle elementary grades. The chapters are fairly short, and the action is high, so children are motivated to complete the book on chapter at a time. The Magic Treehouse is a great series. It is the perfect bridge from predicable books to chapter books because the sentence structure remains fairly simplistic. My son read every single book within this series and loved each one. Chapter books increase in difficulty and give a greater storyline, plot, and setting. 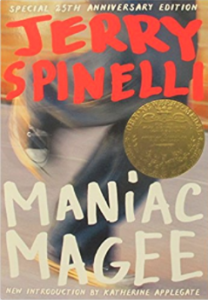 Maniac Magee is my favorite of these chapter books. It tells a story about a boy who helps an entire community by being “colorblind”. You’ll have to read the book to see what I mean by “colorblind”. As children work their way through these chapter books with slightly longer chapters and slightly more difficult sentence structure, they prepare themselves for young adult novels. Young adult novels are the final stepping stone for elementary students. These are great books for children in 5th & 6th grades with well-developed reading skills. 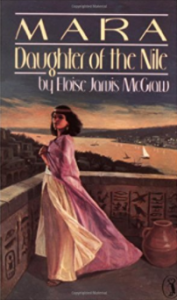 Mara, Daughter of the Nile is my all time favorite of these books. This book is written so well that is has a poetic flow to the sentence structure. The storyline is as well developed as any adult novel I have read. 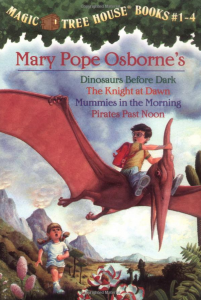 They are extremely well-written, tell an great story, and leave children wanting to read more. They are also great books to use during your Shared Reading time! Choosing a book that is at your child’s reading level is easier than you might think. I like to use the 3-finger rule. Go to the library, bookstore, or even Amazon.com. Have your child read the a page from the middle of the first chapter. Amazon will let you preview the first chapter of their books. Each time your child comes across a word that he or she does not know the meaning of, or has to sound out – put up a finger. If your child can read the entire page with three or less fingers up – the book is achievable. Your child will be able to make sense of words that he or she does not know by the context clues. Here is how context clues work. Let’s say your child does not know the 6th word in the following sentence. I went to the store — night. You can use context clues to understand that the hyphens have substituted the word “last“. So, the sentence would read, I went to the store last night. As your child reads more and more, they will be able to use the context clues not only to help with unfamiliar words that they would normally have to sound out, but they will also learn the meaning of words through context clues. If a book is too difficult, but your child is really interested, I encourage you to read the book with them during your shared reading time. That leads me to number two. Shared Reading is my second strategy for 3rd Grade Reading Help. Everyone loves having someone read to them. If you cuddled up to your mom or dad – it’s all the better! Take advantage of this fact. Read with your child every day. Trust me – as a father whose two boys that are grown and gone, the time I spent reading with them is time that I truly cherish. It seems like just yesterday that they were in elementary school. My how time flies. Shared reading can be done in a number of ways. If the book is far too difficult for your child, you can read. If the book is slightly too difficult for your child, you can take turns reading. And if the book is at your child’s ability level, you can listen as your child reads. The best part about shared reading is that you can stop in the middle of the story to explain words your child has never heard before. This is helping to develop their vocabulary, which is a huge when it comes to reading comprehension. You can talk about the characters and the choices they have made. You can discuss what the characters could have done differently, or what you would have done in that situation. You can talk about the setting. Discuss if you would ever like to take a family vacation to a place similar to the setting. All these discussions help paint a vivid picture in your child’s mind about what is happening in the book, which in turn develops their reading comprehension. When you read with your child, you are modeling the importance of reading. 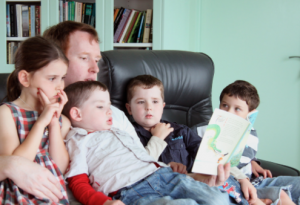 By setting aside time for shared reading, you are showing your child that reading is important enough to shut off the TV, internet, and smart phone. You are modeling what good readers do every time they read. You are also modeling the type of behavior that will ensure your child’s success in school. Shared Reading is so important that you could even use some of your child’s “Time in the Saddle” as shared reading. Time in the Saddle is my third strategy for 3rd Grade Reading Help. 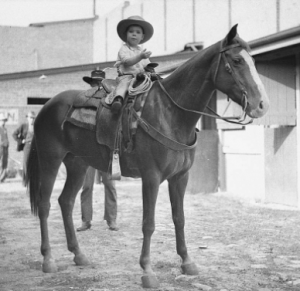 In order to ride like a cowboy, you have to have hours and hours in the saddle. In order to become a proficient reader, you have to have hours and hours of reading. Establish a specific time and place for your child to read every single day. Reading is nothing more than learning a second language. If you immerse your child in the language of reading – your child will learn to read with smooth fluency and strong comprehension. When my son was in second grade, his teacher required 20-minutes of reading each night. Being a teacher myself, I saw how children who only read the minimum amount of time never really excelled at reading. Because of this, I had my son read for an hour each night. At first he thought it was an “awful lot of reading”. However, after about a month, he was enjoying the reading so much that I never heard another complaint. I believe that raising children is a lot like training a dog. If you get a dog as a puppy and you never feed it from the table, then your dog will not beg for food. However, the minute you feed your dog from the table, you will forever have him drooling on your knee as he begs for more. If you establish a specific time and place for your child to read and you are consistent, then your child knows what to expect. This makes your job as a parent so much easier. Finally, Book Chat is my fourth strategy for 3rd Grade Reading Help. Talk with your child about what they are reading. Children love to talk about the movies that they see. They can tell you every aspect of the movie, because they get so engrossed in the movie that they feel like they are part of it. They can tell you all about the characters and what they did. They can tell you why a particular character ended up in a hair-raising situation, and how that character finally saved the day. You might say that their “movie watching comprehension grade” is an A+. You can do the exact same thing with your book chats. Ask your child who the characters are and what they are like. Are they nice? Why? W hat do they do that makes them nice? Are they mean? Why? What do they do that makes them mean? Where do they live? Is it present day, the past, the future, or a fantasy world? Describe where the story takes place. If they do a good enough job, you will understand the book as well as you understand the movies that they tell you about. If you implement these four simple strategies, you will be surprised at how much better your child is reading in as short a time as 3-months. As Promise, here is my great resource for reading success. Reading Horizons is a complete reading program that utilizes a cyclical learning approach, where an educational concept is first introduced, then reinforced, then revisited again and again – each subsequent time at a higher and higher level of competency. Reading Horizons has an incredible method for teaching children how to decode words. This is a systematic way of sounding out unfamiliar words that children come across as the read. The video below show how this process works & why Reading Horizons is so very successful. I have written a number of books that are available on Amazon. I have nonfiction books on mathematics that link to video tutorials and are designed to help children gain a deeper understanding of the math. Here is a link to the first book in my series on fractions. I have also written a chapter book and a young adult novel. You can have a free preview by clicking on the links below. MY ADVENTURES WITH CHICKENSPIKE – This is a chapter book that is perfect for children in 3rd and 4th grades. 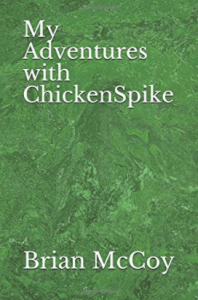 My Adventures with ChickenSpike is a Children’s Fantasy Book. The main character is a young boy who is being bullied. He travels to a distant planet and finds his inner strength. By the time he returns home not only is he no longer a victim, he is a hero! 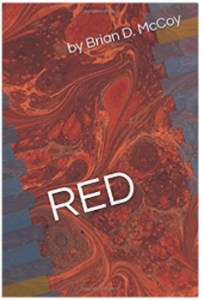 RED – This is a young adult novel that is especially designed for children in 5th and 6th grades. Red is an action packed adventure with two main characters and a number of supporting characters that add humor and drama to this novel. Bruno Vic and Evelyn Rose attend Sir Francis Drake Middle School. Bruno is big, street-wise, and tough, but he also has high morals and undying loyalty to his friends. Evelyn Rose was born rich, but an unfortunate turn of events has landed her in the heart of the Tenderloin District of San Francisco. Bruno, Evelyn, and their friends are desperate to steer clear of the gangs, so the turn to a mysterious man that the gangs seem to fear. His name is Red. If you have any questions or would like to share your feelings, please leave a comment below. I will reply as quickly as possible. Previous Free Learning Games for Kids – What’s the best way to use them to help your child excel? Next How to use TeachersDungeon – Instructions for Teachers, Parents, & Students.